Adobe MAX AIR Code Camp - Second Instance Added! Adobe MAX 2010 staff informed James Ward and me that our AIR 2 Code Camp sold out last week. While we were stoked, we realized that this means there is a lot of people who will miss out on it. To solve this problem, Sarah Eaton added a second instance of the lab. The second instance was added this morning and is already starting to fill up as space is limited. If you want to take this course or you're even just thinking about it, we recommend you book it now to reserve a seat. Attend this mega-lab for a comprehensive, hands-on dive into Adobe AIR for Flex 4 developers. You'll learn how to use the latest features of AIR by building several applications on your own computer, and leave with source code for more than 12 applications. We'll cover using the microphone class, writing to a local drive, launching a native process, and more. The lab includes a sneak peek at developing AIR applications for the Android OS. The courseware is modularized so beginners can follow along. The second instance is now also sold out. After Adobe MAX, I promise that the assets will all be shared via this blog including complete access to source code. A worry about HTML5. Fragmentation. I have looked at a few HTML5 examples. One of them I went to see is apparently financed by Microsoft at this URL: http://www.beautifulexplorer.com/ I clicked on the link using Firefox and got the following message displayed. This is not the only time I have seen such a message. 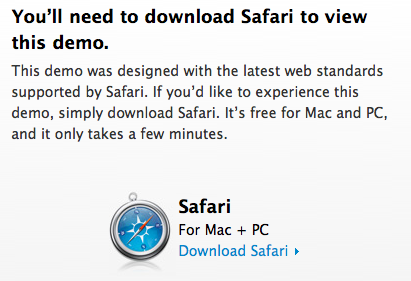 I went to see Apple's HTML5 gallery and this is what I saw. Oh - and there are similar messages from Chrome sites done in HTML5 such as http://www.thewildernessdowntown.com/. OK. Adobe loves HTML5 and I think it is a great thing for the web if the standards are adhered to. Having worked for standards for over a decade, I know the standard must be written in a manner that multiple implementations are 100% interoperable. What will harm the web is if sites start becoming specialized or optimized for different browsers. Most people shouldn't have to download and use different browsers for different sites. I am worried because I saw this trend with CSS. There are still nuances between the manners in which different browsers handle various CSS declarations (just ask anyone who has recently skinned a Drupal site). 2. Let's ensure that we have consistent implementations. If the W3C recommendation is ambiguous, those who note the ambiguities have a responsibility to work this out at the standards development table so the web does not become fragmented. 3. Let's ensure that the enumerated lists of codecs for things like video is not fragmented in HTML5. 4. Let's not start mixing HTML5 specs with O/S specific hardware acceleration features that break interoperability. 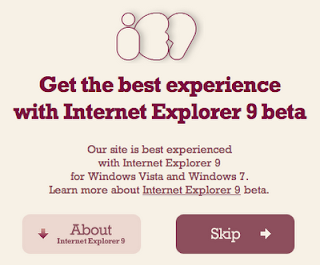 I trust standards and I am going to remain optimistic about HTML5's future. I am presuming that the current state is only a temporary one due to the fact it will take some browsers a while to fully implement the specification (which is understandable). Nevertheless, it means a great deal to Adobe, as the leading tools provider for web development, and it means a lot to me personally and I felt I had to say what I said here. Let's move HTML5 into the next generation and do it right! Dimmable 120 volt LEDs for the house? In the past there have been multiple articles on Technoracle about energy efficiency and ideas for greener, lower footprint living. Recently we came across a number of really cool LED products that advertise they are ready to replace conventional bulbs and save consumers money while using far less energy. We're going to test a number of them over the next year and report back. The first item is a 120 volt, 2 watt LED Dimmable G16.5 Decorative Globe. This is a product from TCP, which is advertised as a medium base that throws off Halogen white color. We have ordered two of these (Cost is $17-18 each) to test to see if they do pay for themselves, which we suspect they will. The second is a comparable product, which is also dimmable. It has slightly more power (rated at 3 watts) and is the dimmable G16.5 Decorative Globe with Candelabra Base. This product also advertises Halogen white light. Our hope is that both of these are able to do the job of regular light bulbs while saving money and throwing off a light that is indistinguishable from conventional bulbs. Both of these are advertised as comparable to a 15 watt conventional bulb. These should therefore be effectively reducing electrical bills by 80% and lasting much longer. Given conventional incandescent bulbs last around 2 years and cost $1, these should have an ROI of around 4 years based on 1500 hours per year at 8c/kwh. Technoracle will also begin testing some LED Ceiling Lights to replace conventional Halogen designs. 1000bulbs.com has these on sale for 50% below retail price today so we will order a few and report back. Every week leading up to Adobe MAX 2010 we will feature a special Adobe LiveCycle ES related session on Technoracle. This week's session is very special and unique in two facets. First, it is the very first time a LiveCycle ES 2.5 lab has been offered to members of the general public. This in itself is reason enough to attend this session as it gives developers a head start over the rest of the pack in terms of getting familiar with the next generation of LiveCycle. Second, this is a complete A-Z hands on lab covering a ton of material over 1.5 full days. This makes it the longest session we have ever offered at a MAX event. This session is already nearing sell out capacity so if you are going, please register as soon as you can. This program for enterprise developers combines 1.5 days of introductory preconference training on LiveCycle ES2.5 (Enterprise Suite) with a full conference pass to MAX 2010. The preconference lab, "Developing a LiveCycle ES2.5 Application," is an essential introduction to developing user-centric applications with Adobe LiveCycle ES2.5. LiveCycle ES2.5 allows both business and IT professionals to visually assemble end-to-end processes, which when combined with rich interfaces, create engaging applications that unify systems and people quickly and flexibly. We'll present an end-to-end use case bringing a rich Internet application (RIA) and a LiveCycle application together. You will learn about the LiveCycle IDE, the Admin User Interface, and the LiveCycle ES2.5 solution components as we guide the participants through the development of this comprehensive use case. We strongly recommend this training to those new to LiveCycle ES2.5, or those who would like a refresher, in order to get the most value out of the more advanced LiveCycle topics that will be presented during the MAX event. Here is a video from Chantal Richard highlighting some more reason why this session is a "must attend" event.